Less than three months after its official unveiling, prices and spec for the Hyundai i30 have been revealed. The carmaker is planning a major assault on the segment with the well-specced Hyundai i30 starting at just £15,195. The most expensive model will cost £24,695. Hyundai have carried out a major revamp of its bestseller and the i30 has improved appeal and more agility. There’s also a host of design and engine updates including the nose of the car. The Hyundai i30 is available in five door and Tourer models with the top of the range Hyundai i30 Turbo available in five and three door formats. The entry-level model comes with a lots of equipment as standard including Bluetooth connectivity, keyless entry and USB connections. Options include 16 inch alloy wheels, cruise control, rear parking sensors and electric lumbar support in the front seats. Opt for the Hyundai i30 Premium and owners will also get to enjoy 17 inch alloy wheels, HiD self-levelling headlights, dual zone climate control, engine stop/start and heated seats and steering wheel. There’s also a range of five engines and a variety of power outputs. There’s also 1.6 litre diesel unit with two power outputs of 110 PS and 136 PS. The Hyundai i30 also comes with either a 1.4 litre 100PS engine or a 1.6 litre 120PS which is naturally aspirated. 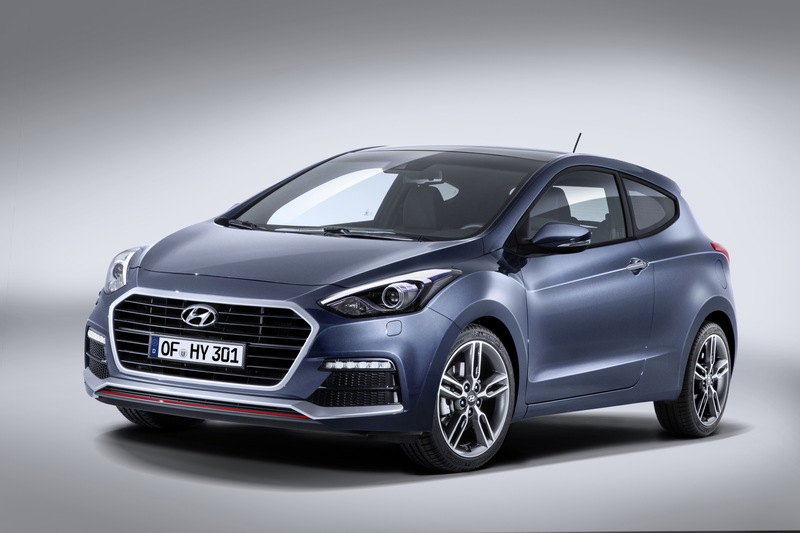 There’s also a new option which is Hyundai’s new 1.6litre turbo-GDI engine which produces 186PS. The new Hyundai i30 1.6litre CRDi Blue Drive model is also one of the most frugal. It should return around 78mpg on the combined cycle with CO2 emissions of 94g/km. However, all of the new i30s have improved economy figure and there’s a range of improvements to help reduce fuel consumption including low rolling resistance tyres and alternator management system. There’s also a new active flap in the front grille which helps to reduce the car’s drag. Indeed, the firm’s European design team has introduced a range of impressive updates and features and should appeal to a wider range of potential buyers in the UK. The big difference between this and the outgoing model in its appearance is the addition of the firm’s hexagonal grille. Available to buy now, the new vehicle will be in showrooms in March. This entry was posted in Car Leasing, Car Updates & Releases, Cars, Family Car, New Cars, Sports Car and tagged hyundai i30, lease hyundai i30 by Steve Lumley. Bookmark the permalink.